The following information sets out a brief history of our estate and the area surrounding Cumberland Market, for a detailed account of the history of the site of the allotments, please refer to an article by David Hannah, Chair of the Cumberland Basin Horticultural Society (CBHS) in Edition 35 of Camden History published by the Camden History Society. Acknowledgement and thanks to Sue Marsh Cann and Ross Houston (both Peabody), David Hannah (CBHS) and Mark Aston (Estate resident) for their help and assistance in providing some of the background information and the old photographs and images used below. History of the area – the area known today as Cumberland Market was originally planned in the 1820s by the architect John Nash as a major market to serve north London and in particular the Regent’s Park area which he was mainly responsible for developing. It became known as the Regent’s Park Haymarket when the original Haymarket in Piccadilly relocated to this site in 1830. 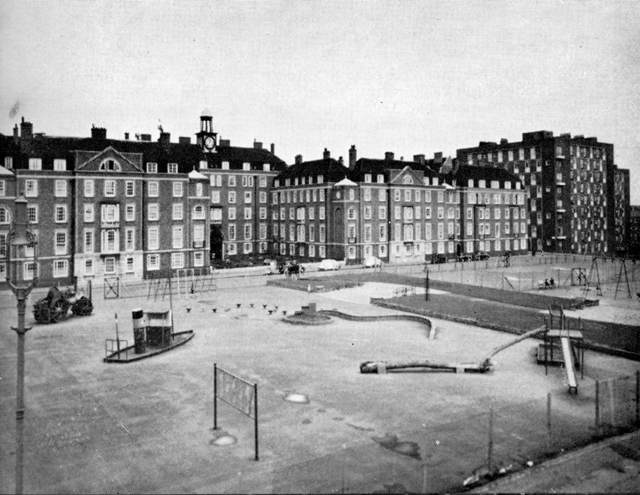 The site of Cumberland Market today, consisting of play and recreational areas, a day centre for the elderly, a doctor’s surgery and the West Euston Partnership’s H-Pod, more or less retains the outline of the original Haymarket site. The original Market was established close to the old Cumberland Basin, part of the Regent’s Canal which was closed in the 1930s and is now the site of the allotments on our estate. (see ‘before’ and after’ photographs set out below) . The Regent’s Canal was originally developed as a means of delivering goods into north London and the Cumberland Basin was built as a spur off the main canal and led between the Nash designed Park Village East and Park Village West and into the market itself. 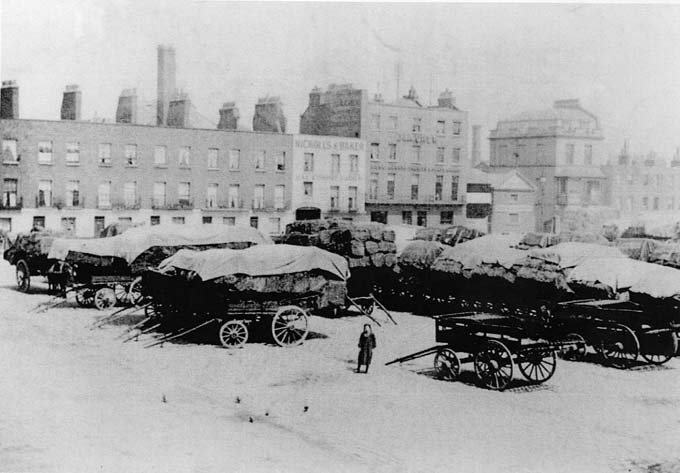 Hay and straw were brought in by barges along the canal for sale in Cumberland Market and for supplies to the nearby Albany Street army barracks. These barges, each capable of carrying over thirty tons, would also arrive with heavy goods such as stone and lime for building works and coal and timber for the neighbouring coach-building and furniture trades. Ice, too, was brought in from Norway for use by local people and businesses, and ice-storage vaults over 25 metres deep and with a capacity to hold over 1,500 tons of ice, were situated under Cumberland Market. Vegetables and cattle were also transported along the canal, therefore reducing the need to be driven through the crowded city streets. 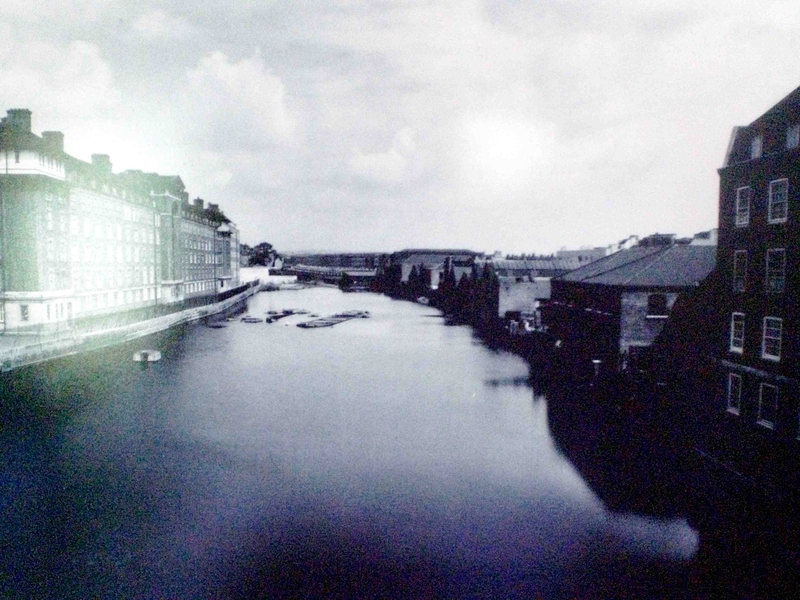 During its heyday, the Cumberland Basin, and now the site today of the majority of our estate, was surrounded by warehouses, wharves and docks for barges to unload their goods. (see photographs below of the Basin by the side of Ascot House, Swinley House and Camberley House). 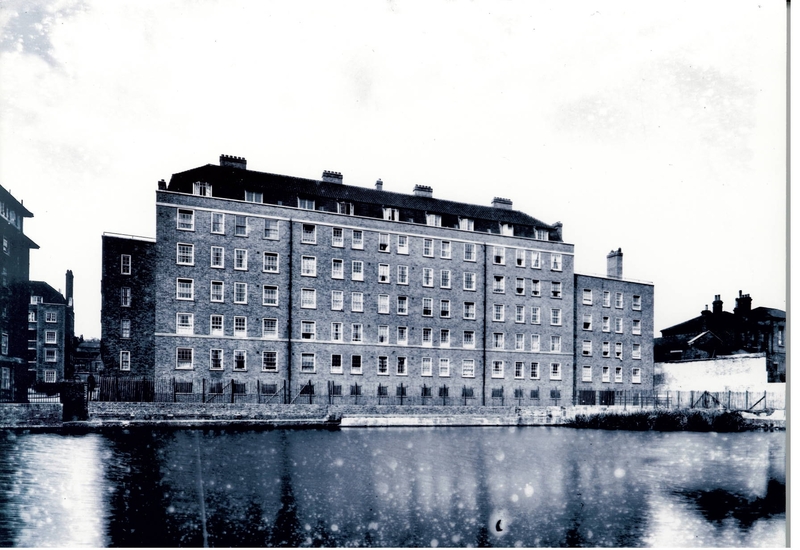 Records also show that in the 1920s, where Ascot House now stands, there was a film processing works and articles from the time relate to a serious fire breaking out and workers, in an attempt to escape the flames, jumping from windows into the canal but were impaled on railings surrounding the water. 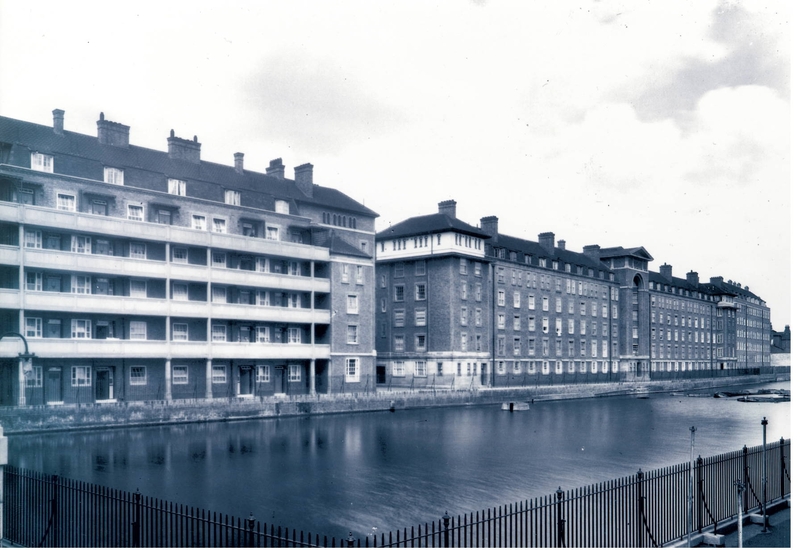 In fact, parts of our estate were so close to the canal that many older tenants can remember, as children, fishing out of their bedroom windows! 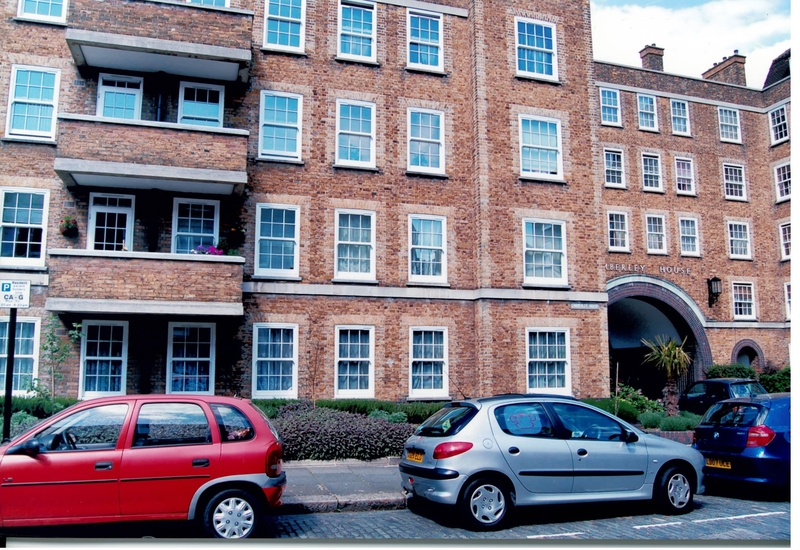 Other memories from older residents from this time include recollections that Redhill Street was one of the busiest areas in north London for prostitutes to pick up their clients and was known amongst locals at the time as ‘Redhot’ Street! A market continued on the site right up until the late 1920s, and the last trading barges ceased sometime in 1930. In 1938 the Cumberland Basin was cut off from the main canal and drained and in the next two years it was formally abandoned. By the early part of 1941 the basin had been filled with rubble from bomb damage sustained in the Second World War and in the years following the war the site was covered with topsoil and turned into the allotments which are so much a major feature of our estate today. 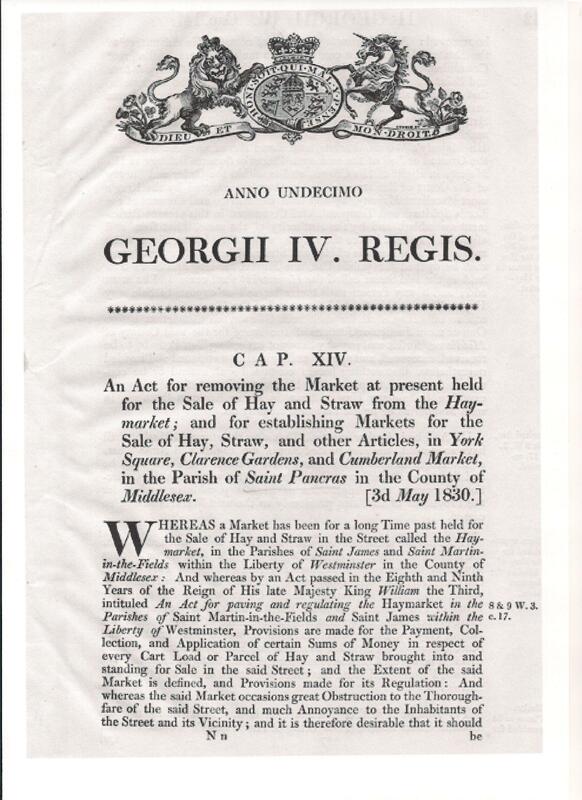 The former Cumberland Market site today remains an open space thanks to an 1830 Act of Parliament (see copy below) which prevented any large-scale building on it in the future. When in 1953 a community play centre was established here, a decommissioned steam roller was left behind as a giant climbing frame for children. Later deemed dangerous, it was covered up with soil, to be rediscovered in 1989 and was restored for use at local events. Many elderly residents will recall that In 1965 the play centre was transformed into a unique fully staged children’s paradise – a miniature town including a row of shops, and a road system with pedal cars, bicycles and traffic lights, an underpass and filling station. ‘TrafficTown’ amused local children for the rest of the decade. The now quiet open space is the venue for the West Euston Partnership neighbourhood festival held on the site each summer, while the Haymarket Centre is a day-care centre facility for the elderly next to a doctor’s surgery and the H-Pod, a local community and activity centre. 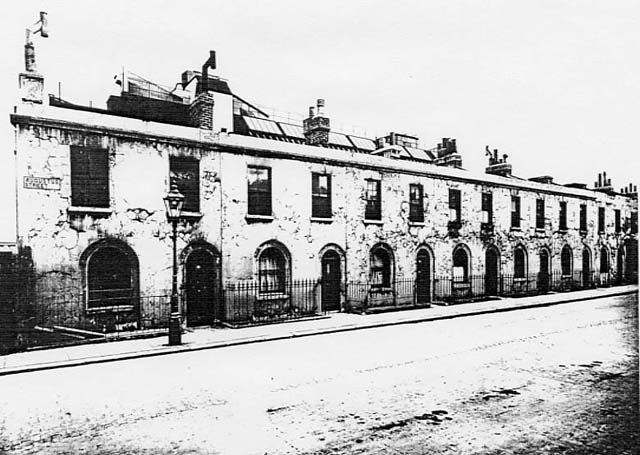 History of our estate – After World War 1, The Crown Lands Commissioners – later to become the Crown Estate – demolished and redeveloped much of the area around the Market and the Cumberland Basin. 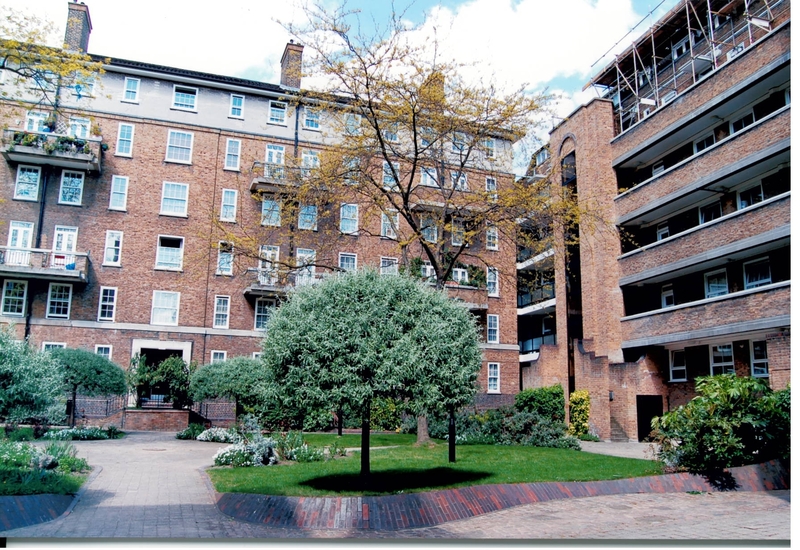 Over the next ten years, our estate, consisting of 500 flats in seven state-of-the-art blocks were built between Redhill Street and Augustus Street – these became known locally as the ‘Crown Estate flats’. Our estate’s origins were very much part of the Government’s ‘Homes Fit For Heroes’ housing programme designed for war veterans and community workers – the keyworkers of today – and their families. The estate was designed by architect C E Varndell (nearby street named after him) and the first block completed in the late 1920s was Datchet House, which was given Royal seal of approval in 1932 with an inspection by the Duke of Windsor (later Edward VIII). 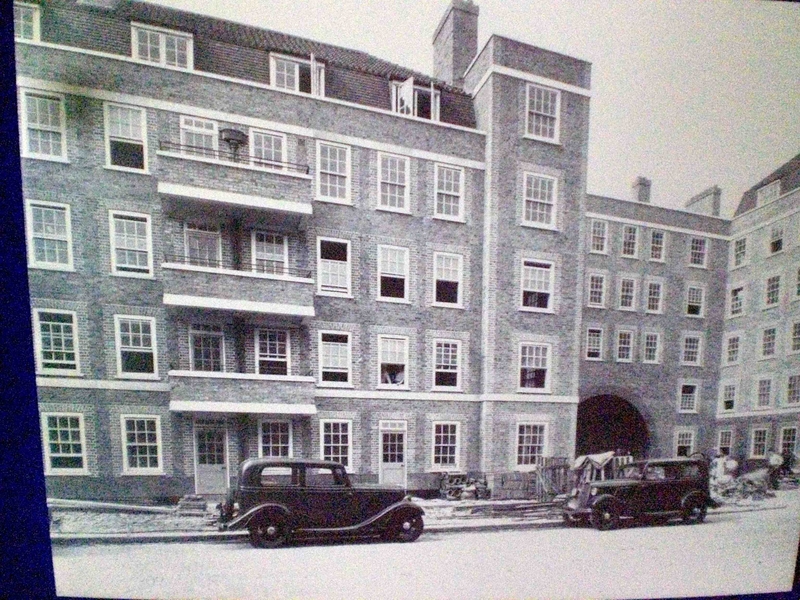 Camberley House, the last of the pre-WW2 blocks, was completed in 1937. 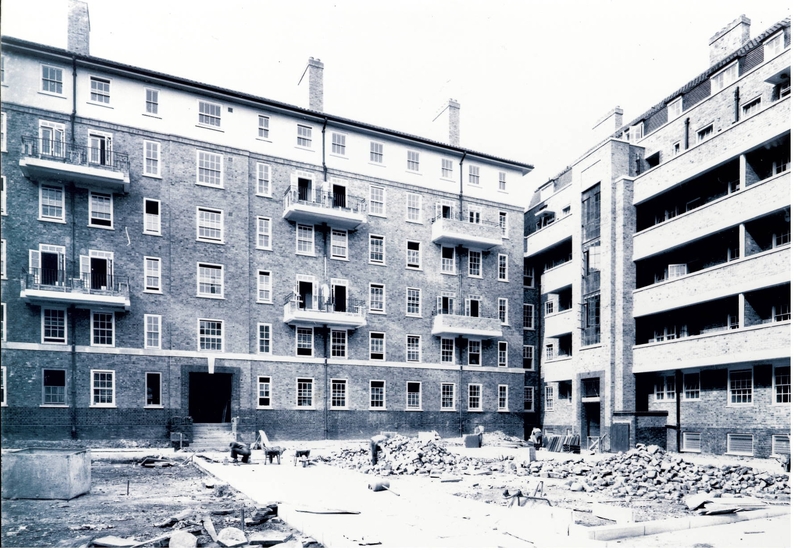 (see photographs below of the construction of Camberley House c1931). The Crown Lands Commissioners hired Miss Maud Jeffrey to manage the new estate. 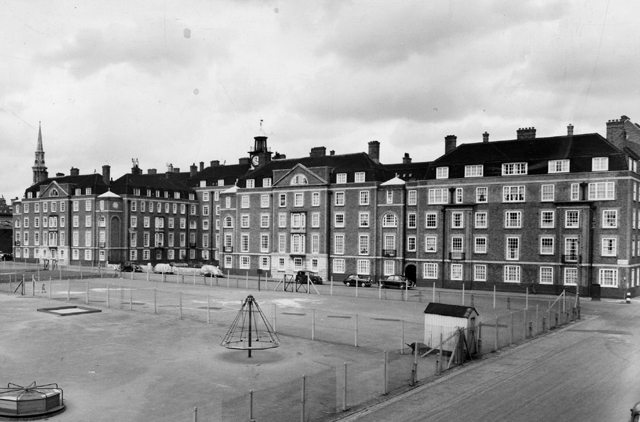 Miss Jeffrey was a former assistant to Octavia Hill, who, along with George Peabody, became known as two of the earliest providers of housing for the poor in London. Maud Jeffrey’s employment contract was based on collecting a percentage of the rents from the estate for her salary and her housing management principles at this time were very much based on Octavia Hill’s strong Christian principles of abstention from strong drink, moral living, self-improvement and self-help. Rent arrears or any bad behaviour were not tolerated, rules were strictly enforced and bad tenants were evicted without notice or legal redress. Harsh as some of these rules and conditions might seem to us today, they were surprisingly popular – older tenants today, who grew up as children on our estate, remember the high standards of housing and living conditions as a result of these strict rules being enforced. Below – copy of a letter written by Maud Jeffrey in 1940 to a tenant on Cumberland Market Estate accused of noise nuisance. As you can see this tenant received immediate notice to quit. I regret to hear that you have disgraced our flats by a very noisy week-end party. We have never before thought it necessary to make any rule about low-class noise from people in the flats, but this is undoubtedly what you subjected your neighbours to on Sunday night. There is some ground for thinking that this was some celebration of your second son’s going into the Army. If so I am the more sorry to hear it. Such ways of “celebrating” are I am sure quite unworthy of our cause, and most of our men would I am sure feel it so. I am sending you a Notice to Quit. If you have anything to say about it will you come to see me to-morrow (Tuesday) morning? Why was there a dog in your premises this morning? Bearing in mind that this happened during the war years and the tenant’s son was leaving to serve in the army, the punishment seemed a little harsh! Maybe a sign of things to come in later years from the Crown Estate?! 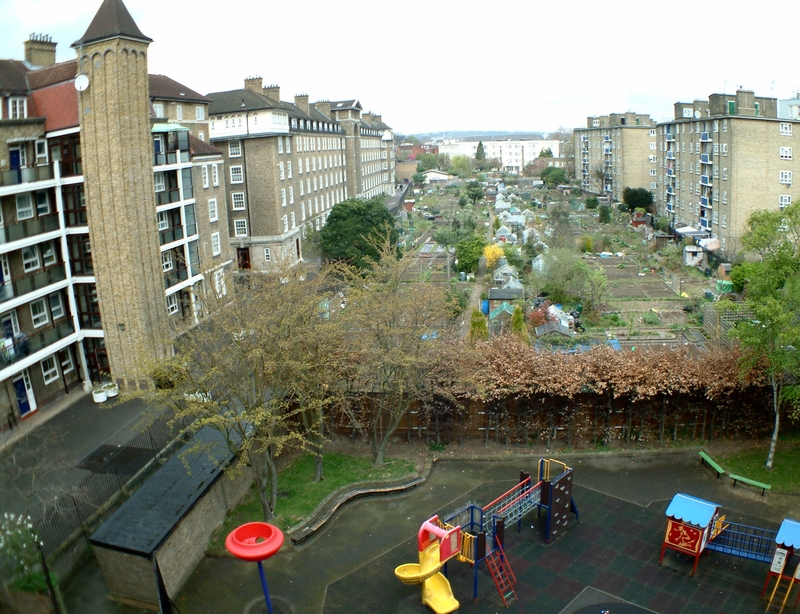 Despite similar examples of the above letter sent to tenants, the Crown Estate properties acquired a reputation in the area for sound housing management and residents living on the ‘Crown Flats’ enjoyed better living conditions than many tenants living on other housing estates in London at the time. For the first time, tenants enjoyed indoor bathrooms and toilet facilities, running hot water, electricity and, above all, they were not living in bug and vermin-infested property which records at the time show made up the majority of property in the Cumberland Market area. The ‘Crown Flats’ retained a reputation for high standards of housing for many years. As well as the area where our estate now stands, the Crown Estate also owned most of the area surrounding the Cumberland Market site but in 1949, much of its land to the south and east was acquired by compulsory purchase order by St Pancras Council. This land later became the nearby Regent’s Park Estate, and a major part of the local authority’s post-Second World War redevelopment of the borough. In 2011, after a huge campaign against the Crown Estate’s plans to see our estate (see the ‘Our Homes Are Not For Sale’ page), Peabody took over as our landlord. Whilst it is too early to tell whether or not they will be a better landlord than the Crown Estate was in the early years – not in recent years! – remains to be seen. Certainly the first impressions are favourable and the Residents’ Association here, plus the other RAs in Lee Green, Millbank and Victoria Park continue to work very closely with each other, as well as working closely with Peabody staff and senior management, to improve living, social and environmental conditions and to improve standards of service to our homes. fantastic to see the old photographs of our estate and how things have changed. Who would of thought that we were surrounded by water and a canal, and the present allotments were under water many years ago! This is really interesting. I had no idea about the canal. You wouldn’t mess with Maud Jeffrey! 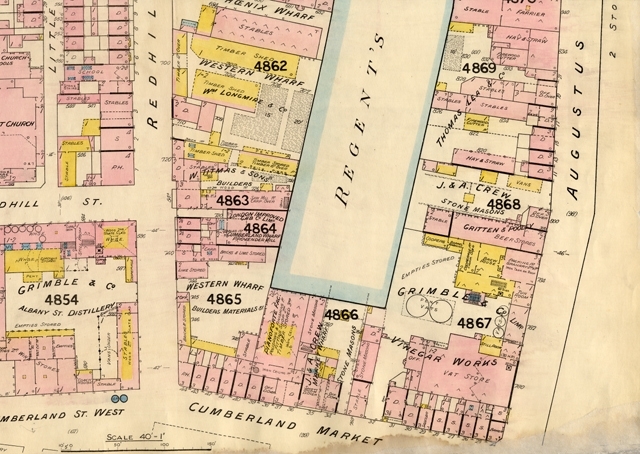 No wonder my flat’s so damp – it was under water for many years! Great website, well done Steve! That is so interesting.I went down there yesterday. The estate’s architect CE (Charles Edward) Varndell was my grandfather. I have a photograph of the Prince of Wales making his inspection in 1932, escorted by him and a formidable-looking lady (Maud Jeffery?). ‘Charlie’ Varndell, as he was generallly known, died in 1933. He was only 56. Very impressive, well done. Not only did three generations of my family live on the estate, one of my cousins still does. I lived in Swinley House and remember the bath being in the kitchen with a hinged wooden table top covering it to provide work space when the bath wasn’t in use. I also policed it from 1976 when I was posted to Albany Street police station. I was told by an older resident that when the canal was filled in, several barges were sunk under the allotments somewhere on the east (Euston) side, may be a piece of history to investigate there some day. Keep up the good work.